FOR MORE INFORMATION OR TO BUY A TICKET, VISIT OUR PAGE AT EVENTBRITE. Join us for our 10th Anniversary Party Dinner event at on March 21 from 6 to 9 p.m. at El Paseo Inn at Olvera Street, across the street from Union Station. We’ll be looking back at 10 years of stories, advocacy, and the people that have made up a decade of Streetsblog. Tickets are $100 per person on a sliding scale. If you can’t afford $100 or you just donated during our winter drive, feel free to slide down to a lower number. There are also sponsorship opportunities listed here. If you have a different sponsorship in mind, email damien@streetsblog.org and we’ll be happy to talk. It’s hard to believe it has been 10 years. With your help, we look forward to celebrating 20 years in 2028! The site is very convenient for riding Metro. Take the Red, Purple, or Gold Line to Union Station; find schedules via the Metro website and trip-planner. Exit Union Station on the Alameda Street side. Walk west across Alameda, continue up to the plaza, then turn right into Olvera Street and El Paseo Inn will be on your right. L.A. is expecting a couple of the biggest rainstorms of the year. Current forecasts call for heavy rain during the day both Wednesday and Thursday, but with a lull expected early Wednesday evening, right around the time of the dinner celebration. Expect rain, or at least cloudy skies. 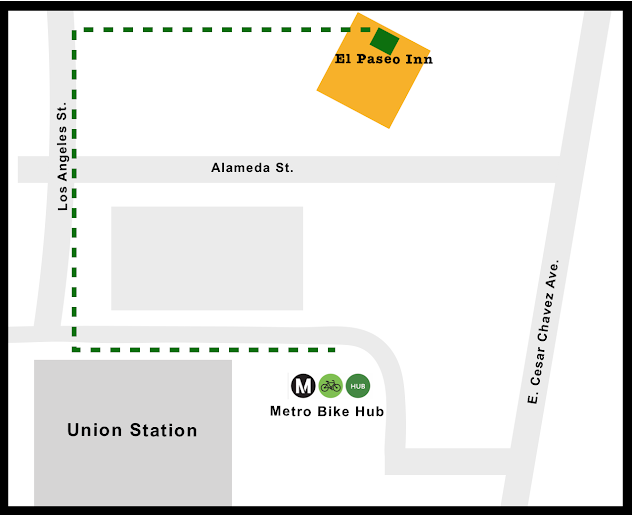 Metro Bike Hub staff will be on hand from 6 to 6:30 p.m. to support in-person registration, to help park, and to provide brief tours of the Bike Hub site. Metro Bike Hub is will be giving away prizes for folks who check-in prior to the Streetsblog dinner: win a Freitag Chuck Pouch ($42 value) or a Niterider Mako 250 headlight and CherryBomb 80 tail light set ($35 value). There are five paid parking lots serving El Pueblo/Olvera Street, and some street parking nearby, especially to the north. Tamika Butler’s time at the LACBC was an unmitigated disaster for the health and safety for cyclists. She oversaw the dismantling of what the cycling community had built up over the prior decade. We are more fractured, less powerful, and less likely to collectively help one another thanks to her hapless and incompetent leadership at the LACBC. Upcoming Los Angeles Streetsblog Events – Live Streams, Fund Raisers, Birthdays!